1 : 31680 Produced against the background of the Napoleonic Wars, these Ordnance Survey drawings exhibit a hightened interest in defence, particularly along the vulnerable south coast. Military barracks are recorded at Hastings, 'Bopeep' and Bexhill. A faded aquamarine wash defines the coastline from Pevensey Bay to Hastings, with red circles indicating observation stations used to plot the distinctive features of the land being surveyed. Inland, agricultural land (delineated by field boundaries) and woodland dominate the landscape. 1 : 21120 Drawing showing the area around Cranbrook in Kent. Green washes distinguish cultivated land and woodland from uncultivated land. Relative relief is indicated by shading and brushwork interlining - a technique known as hachuring. One of the notable features of the Ordnance Survey is the attention paid to accurately recording relief, an important issue in planning military campaigns. This drawing shows different stages of the drawing process. The lower section of the drawing is complete, with place names recorded and brushwork interlining ('hachuring') depicting the relief of the land. The other half of the drawing is unfinished. No record of the steepness of the land has been made and place names are absent. This gives us an idea of the order in which draughtsmen recorded different types of information. A pencil note records that this drawing was published in 1813. This drawing shows the area around Tunbridge Wells in Kent. The town itself is indicated by red blocks, with the surrounding forests and downs depicted by various green washes. Brushwork interlinging and shading ('hachuring') records relative relief. 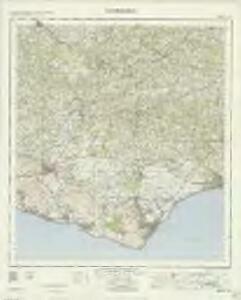 It is in this area in particular that the Ordnance Survey drawings surpass earlier county maps. The draughtsman has represented individual trees forming avenues and blocks, notably in Eridge Park.